Last time I wrote, we'd just had our first snowfall of the year. Two days ago, we had yet another huge snowfall, and Toronto is close to breaking weather records all over the place. Winter in Canada has returned to the roof-high snows of my childhood in London, Ontario. But we're all sick of it, even if we like winter, and I do like winter. It's just enough. It's time for something a little more moderate and a lot more sunny. So we'd better get onto some spring knitting, because it's gotta melt eventually! This spring issue of Knitty is a true spring issue, because it represents quite a bit of spring cleaning. We've completed our massive Archive renovation. You'll see that you now have a choice of drop-down menus...stuff to knit, or stuff to read! Columns are grouped together by columnist, tutorials hang together and so do personal stories. We hope you'll find it useful and thank you for your patience while we completed the work. For a long time, we've been working on a way to get yarn reviews in Knitty, but they had to be done the Knitty way. Grassroots, by the knitters, for the knitters. We think we've done it. Read more about our new Yarn Roundtables, and if you're planning on being in Toronto, or live close enough to drive in, perhaps we'll see you at one of our future events! Knittyspin has also blossomed, just in time for spring. [Oh, come on. I couldn't pass that pun up, could I?] Read more about the new features in editor Jillian Moreno's editorial below. But wait -- are you a knitter and not a spinner? Don't just skip past Knittyspin. All Knittyspin patterns are designed to take advantage of handspun...BUT they're also great for commercially available yarn. Each Knittyspin pattern includes yarn requirements for both types, so you never need to feel excluded. 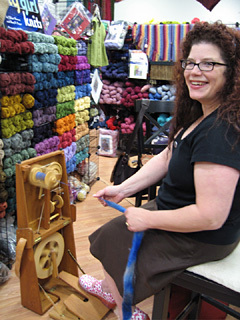 The Knittyspin focus is on spinning for knitters. That means you might be a brand-new spinner like I am, just beginning to see if I like making my own yarn. Or perhaps you want to spin, but just enough to finish a single sweater. Knittyspin is there for you, whatever the level of your interest, and even if you've never picked up a spindle or treadled a wheel. You'll also find previous Knittyspin features and patterns in the new Archive, just in case you get bitten by the spinning bug too. Experienced spinners, as we know, can never get enough information, and of course we've got stuff for them as well. Speaking of the Archive, when was the last time you took a tour? 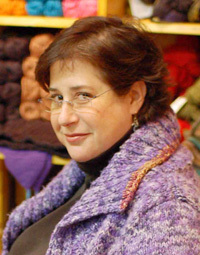 I'm hearing all over the web that people are discovering Knitty patterns from several years ago that didn't appeal to them at the time, but are just what they want to knit now. Tastes change, we learn new skills...so don't forget to check out things you might have missed the first time around, especially when you're waiting for a new Knitty issue to be published. To always know the latest Knittynews, sign up for the free Knitty reader list! The list is never shared with anyone and we only send out a few messages a year. It’s soon to be spring. While I’m still buried in snow in south Michigan, I am willing spring to come. I am looking forward to opening my windows, spinning on the porch, doing some dyeing, and the inevitable spring clean out. By the end of winter I’m ready to set fire to all of the junk I’ve been tripping over in the house for three (or more) closed-up-tight months. As much as I want to shove out with the old stuff, I want new and different things to look at, to do, to spin with. Amy and I have been cooking up some newness here at Knittyspin for you. If it leads to fiber acquisition, please don’t send us the bill (we have plenty of our own fiber bills, thanks). This issue introduces our new feature: the Gearbox. We realized that our designers and authors have the coolest stuff, toys, equipment, and I for one, am tired of trying to guess the wheel from a photo that includes a mere sliver of a bobbin flyer. So now they’re telling us just what they used. Look for the Gearbox and you'll see exactly what equipment was used as part of an article or to spin a project. This issue also starts our fiber reviews -- we call it the Fiber Fiesta!. We don’t want you to miss out on a single opportunity to spin with amazing fiber. So we're collecting great fiber from big and small producers, spinning and knitting with it, then telling you what we think, and, of course where you can buy it. Knitty loves spinning. Knittyspin is all about spinning from a knitter's perspective. Sometimes you want to knit and sometimes you want to spin. To make it easier when you have the spin jones, Amy has concocted groovy little spinny indicators. When you see the pink spindle like the one at the top of this editorial, you’ll know the pattern, article or review is spinning focused. And Knittyspin patterns now feature their own icon [ ] on the main pattern index, to make them easier to spot as well. If you have fiber, spindles, books, or other spinny products that you'd like us to review, write me for submission information.